My book has now been published! It was a long, hard slog, but worth it in the end. Covering such a wide variety of subjects was trickier than I imagined, but hopefully it provides a comprehensive, useful resource for anyone thinking about building a website, whether they are doing it themselves or getting someone else to do it for them. 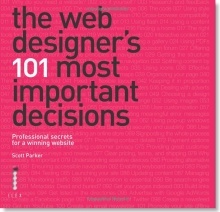 The Web Designer’s 101 Most Important Decisions takes a look at all the things you need to consider and offers advice on how you can achieve your goals. It gives examples of good practice and provides details of useful sites and services to help you on your way, but most importantly it highlights all the key decisions you will have to take as you go. It’s not so much about telling you what to do, but more what you need to think about if you want to be sure of success. Although much of the book is aimed at budding web designers looking to build their first website, it is also helpful to those not wanting to get their hands dirty. If you are commissioning someone else to do the work, having a basic understanding of the technologies and the principles of web design will make it a lot easier to create an effective brief and understand what it is that your website needs. And even professionals need a helping hand from time to time, and this book offers a useful checklist to make sure they have covered all the bases. What this book also shows is that you don’t have to be a coding expert to get a fantastic website. There is almost always a quick and easy way to get what you need, with someone else doing all the hard work for you. This isn’t a cop-out either – no matter how good you are, it often makes perfect sense to take a few short-cuts if you want to save time, money and your sanity. I only skim the surface of what could be written about the design and development of websites – many sections could easily have had whole chapters devoted to them, some whole books – but I have highlighted all the issues you should explore. The web is full of great advice, but sometimes you need a nudge in the right direction and this book gives you a starting point to find out more. Of course, any book on web design can only provide a snapshot of the time. Things move quickly on the web and what might be accepted as best practice now could be considered outdated before you know it – I’ll try to highlight any developments on this blog! The book is available in many bookshops, but take a look on Amazon to get a sneak peek.